North Shore Assembly of God is a multi-cultural church in Skokie, IL. We are North Shore Assembly. A church with a desire to see people connect to God in a life-transforming way. 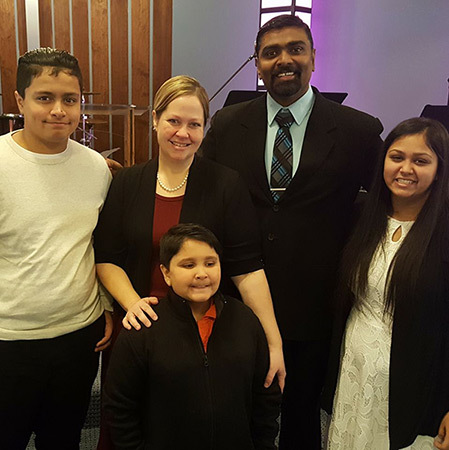 We are a multi-generational, multi-cultural and multi-ethnic church located in Skokie, IL. Welcome to North Shore Assembly. Hello! My name is Pastor Sangram. My wife Sarah and I would like to take this opportunity to welcome you to our church. North Shore Assembly of God has been a faithful congregation unto the Lord for over 50 years, interceding and reaching out to the northern suburbs. My family and I are relatively new to the area but we are excited to serve with this loving, multicultural fellowship. I was born and raised in India and my wife is from Illinois. We have been married for almost 17 years and have been blessed with 3 children. Our heart is to serve God and His people, giving Him glory in all we say and do. We believe that Jesus wants an intimate relationship with all who will come to Him, with the Holy Spirit and the Bible as the guide for that to happen. It is our goal to be the best disciples we can be and to help others do the same. We look forward to all the great things God has in store for the Chicago-land area. Discover God. Grow in Faith.